What are the effects of earwax blockage? What are the ingredient in Earigate? Can Earigate help prevent wax build-up? What are the recommend dosages? Is Earigate easy to use? What is the difference between the device for adults and for children? How should Earigate be stored? Can Earigate be used safely? Are there any side-effects associated with Earigate? What are the commonly used earwax treatments? What is the role of Earigate? When should Earigate not be used? Earigate is a new ear cleaning system. Earigate technology was developed by Canadian ENT, Dr. John MacRae. Earwax is produced in the outer one third of the ear canal, by secretions from glands that line the canal. Earwax helps to keep the ear clean and lubricated, and protected against infection. Earwax becomes a problem when too much builds up and blocks the ear canal. Earwax blockage can result in hearing loss, pain, ringing, dizziness, and infections(2). The Earigate device has a soft, rounded tip that is inserted into the ear. A guard prevents the device from going in too deeply. When the device is activated, the Earigate solution passes along the tube, to the end piece, which results in the flow of solution being directed back out of the ear canal. The earwax is then forced out. The nozzle's patented duct system, developed by an ENT, expels wax by projecting fluid into ear canal without forcing it against the tympanic membrane. Earigate is comprised of 100% natural-source sea water. The solution is isotonic and contains no preservatives. The patented Earigate device effectively clears out earwax, and the ear wash solution keeps ears clean(1). Impacted earwax should be removed by a physician prior to using Earigate. Earigate is indicated to reduce wax accumulation. Regular use of Earigate reduces the risk of wax build-up(1). Adults: 1-2 applications, 2-3 times per week. Children, six years and older: 1-2 applications, 2-3 times per week. Daily use is acceptable for patients with heavy wax build-up. The Earigate system is simple, easy and comfortable. The head is tilted to one side, and the device is inserted into the ear. The device is activated and a nozzle projects fluid into the ear canal. The procedure is then repeated on the other ear. The stream of the adult device is 3 ml/sec; in the children's device, the stream is 2 ml/sec. The size of each device is adapted to the auditory canal. Children should switch to the adult size at 12 years old. Earigate should be stored at room temperature, away from heat. The product should not be frozen, or kept in a cool place. The shelf life of Earigate is three years. The product is good until the expiration date printed on the label. 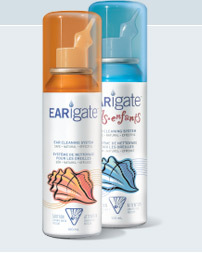 Earigate is hypoallergenic, causes no rebound effect and prevents eardrum from being damaged. The mechanism of action-the flow of solution directed back out of the ear canal-prevents the eardrum, and other sensitive and important structures of the ear, from being damaged. This technique also avoids the uncomfortable feeling of water hitting the eardrum. When inserted fully (i.e. until the guard rests against the ear canal), the tip of the Earigate device will extend up to 1.7 cm into the ear canal. The length of the ear canal in children and adults is no less than 2.2 cm and 2.5 cm respectively, leaving a clearance of 0.5 cm. ENTs perform approximately one million ear-care procedures every year(3). The most commonly used procedures are ear irrigation and the curette technique. Ear irrigation involves fluid being injected under pressure to remove the accumulated wax. With the curette technique, wax is scooped out with a curette-a small metal ring at the end of a metal handle(2). At home, consumers use cotton swabs, solutions, and syringes. Earwax is a proven, effective ear cleaning system, which has demonstrated a decrease in wax build up, when used regularly(1). In children under the age of six years. By patients with tubes in their ears, unless advised by a physician. By patients who have otitis or any other ear infection, unless advised by the physician. By patients who have a perforated eardrum or who have had mastoid surgery. To remove impacted wax. Impacted earwax should be removed by a health care professional prior to using this device. Warnings: If pain or bleeding occurs, medical attention should be sought immediately. (1) Obervations are based on patients treated by Dr John MacRae, developer of Earigate. (2) Jabor MA, Ameedee RG. Cerumen Impaction. JLa State Med Soc 1997; 149: 358-62. (3) Estimated based on results from the ministry of health and long-term care of Ontario.